Weekends transform Shenji New Village into a lively, crowded location, as most of the culture and creative shops are connected to several similar shops on ZhongXing Street and Calligraphy Greenway. The village, created in a renovated old residential community by Taichung City Government, has today become a culture and creative hub for young people, with its two-floor vintage structures fusing the old and new to attract both local residents and tourists. Here, the low-key A Good Day Records shop also welcomes visits by music aficionados, who can enjoy listening to music with headphones. A Good Day Records was established in 2003 and started out selling foreign and local independent (indie) music. After graduating in Taiwan with degree in Journalism, owner Charles decided to focus on his favorite music as a career path and started the company. Noting the growth of the MP3 format and development of other audio electronic products between about 1997 and 2000, together with the rapid decline of CDs, he realized that the world of music marketing was changing. Consequently, he rented a friend's basement and founded a music company that traded in "un-trendy" global music. However, his unfamiliarity with foreign currencies and the high cost of records have influenced his music business since that time. Left: A Good Day Record's interior includes an extendable bar table, where music lovers can simultaneously enjoy drinks and music. Right: Soft corner bean-bag chairs are ideal for relaxing and listening to music. Another challenge he faced was marketing. Charles notes that seeking out indie music CDs at most music shops isn't easy. However, his transferal of such music into digital files and cooperation with cafes and bookstores means that customers can enjoy more chances to listen to such music in these locations. Other services provided by A Good Day Records include serving as an agent and music composer for artists and groups like Ze Hwang, 929 Band and Dadado Huang. This sets A Good Day apart from other larger music and entertainment companies as it promotes non-mainstream musical trends via low-cost, but extraordinary, Internet-based marketing and small concerts. "The CD's cover art is a method for developing a musical story and customers who buy a CD may enjoy visuals as well as the music," notes Charles. The variety of product promotional methods led him to ponder the best way to showcase a product within a studio. Thus, A Good Day Records' physical shop opened in Taipei in 2015 to provide visitors with a selection of free album sampling via iPod headphone players. The shop space isn't large but fully equipped. Charles, who grew up in Dajia, has developed close relationships with Taichung residents and his concert events feature local guest artists like 929 Band's National Chung Hsing University and Tunghai University musicians, who performed at Fulfillment Amphitheater, and Rock In Taichung Festival in Imperial Sugar Factory last year. At the end of last September, G-Music Retail Company shuttered its last shop in Taichung in a sad closure to teenage memories for many local music lovers. However, Red Dot Hotel and Culture invited A Good Day Records to open a shop at Shenji New Village last December in an effort to keep the city's independent musical culture alive. 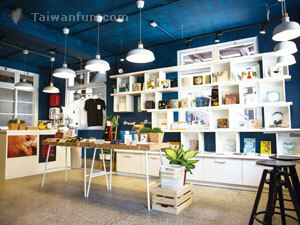 Although the shop's space is quite small, it is fully equipped. "I am a detail-oriented person, selecting every flower pot, cup design and decoration," notes Charles, adding that Taichung is a perfect setting for creating a relaxed interior design that features an extended bar, refrigerator for drinks and soft bean-bag chairs for customers to enjoy music in. Singer Dadado Huang was the on-duty store manager on the opening day in March and kept busy signing autographs, taking photos with music fans, and attracting new customers. In the future, A Good Year will also hold a mini concert in Shenji New Village. The shop offers drip-bag coffees, tote bags, pottery drink coasters and other culture and creative products designed to infuse daily life with musical influences. As Charles positively notes, "Taichung's culture and creative development is growing and we hope to expand the concept of daily living with music and culture and creative products."